“And now there’s a new public event on his schedule later this month that is being billed as a discussion on the future of American politics. David, we’ll be listening closely,” Bruce reassured him. DAVID MUIR: We’re going to turn next to the candidates who want to take on President Trump in 2020. The list growing. Two major names officially announcing over the weekend, and quickly taking aim at the President. Here’s ABC’s Mary Bruce. 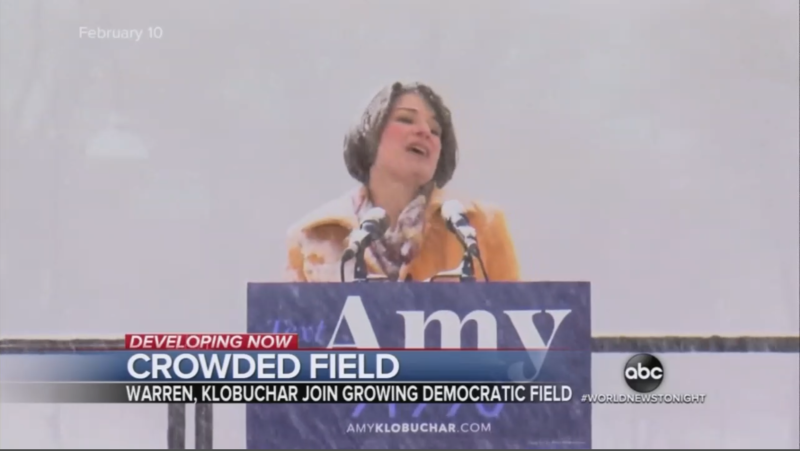 SEN. AMY KLOBUCHAR: We don’t let a little snow stop us. BRUCE: — Senator Amy Klobuchar promising her moderate politics and mid-western roots will win over key states that handed Donald Trump the White House. KLOBUCHAR: I don’t have a political machine. I don’t come from money. But what I do have is this — I have grit. BRUCE: On Good Morning America, Klobuchar asked about recent reports that she’s a tough boss. BRUCE: She’s already tangling with Trump. BRUCE: Well David, Biden says he’s still running the traps on this, and will have an announcement soon. And now there’s a new public event on his schedule later this month that is being billed as a discussion on the future of American politics. David, we’ll be listening closely.